The SREC Holder and E-Liquid Cartridge. NIDA and NJOY, LLC, have developed a Standard Research E-Cigarette (SREC). The device will help researchers resolve many outstanding questions about how e-cigarettes affect health. As e-cigarettes rapidly became an established feature in American life in the past decade, they raised many health issues: Are e-cigarettes addictive? Are they harmful to health? Will rates of combustible cigarette use fall because smokers switch to e-cigarettes, or might they rise because people initiate nicotine use with e-cigarettes and transition to combustible tobacco? What population groups find e-cigarettes most appealing? Is secondhand exposure to e-cigarette aerosol a health risk? The new NIDA–NJOY SREC addresses this obstacle. It provides researchers with a device that closely resembles commercial e-cigarettes in design and use, and consistently delivers known amounts of each chemical in its aerosol. With the SREC, researchers will be able to conduct well-controlled studies of e-cigarette exposure and evaluate their potential health risks, as well as potential public health advantages. It is also anticipated that the SREC will act as a standard, a “bridge” tool that allows researchers to compare their findings with those of other groups evaluating different e-cigarette devices. The SREC will be available to NIH grantees and other approved researchers starting in early 2018. NJOY has committed to manufacture the device for at least 5 years, so that researchers can rely on its being available and unchanged throughout the course of their clinical studies. Given that clinical research typically takes 3–5 years to complete, until now the risk of a commercial product changing or being discontinued has been a very real problem. Current manufacturers of e-cigarettes were well-positioned to undertake the project, since using an existing product as the basis for the SREC would reduce development costs. Dr. Hampson also points out that the manufacturer of the SREC would gain a new product line with minimal competition. In addition, since August 2016, manufacturers applying to the U.S. Food and Drug Administration (FDA) for authorization to sell any new e-cigarette product must submit characterization data that are similar to those that NIDA required for the SREC. Thus, by collaborating with NIDA, the partnering manufacturer could learn how to navigate the new regulatory landscape and generate the testing protocols and data required to introduce new e-cigarette products. E-cigarette manufacturer NJOY, LLC, was granted a contract and, in consultation with Drs. Hampson and Walton, developed and characterized the SREC, which includes child-safety features and a unique battery connector compatible only with the official sealed and characterized e-liquid cartridges. This tamper-resistance allows the SREC to be used in experimental designs where participants use the device at home. 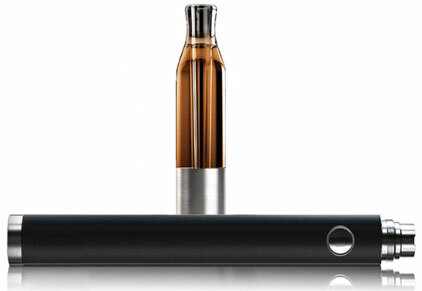 The device characterization data confirmed that nicotine-containing and placebo SREC versions perform within specifications to deliver a consistent quality and quantity of tobacco-flavored aerosol throughout the life of the e-liquid cartridge, throughout a battery charge cycle, and across the lifespan of the battery. Images of the SREC, along with its specifications and characterization data, can be found on NIDA’s website. Once the device was finalized and characterized, it was subjected to nicotine pharmacokinetic tests. The studies compared nicotine absorption from the SREC with that delivered by the subjects’ e-cigarette of choice. A second study phase compared the nicotine delivery of the SREC with that of combustible cigarettes. Dr. Walton, Chief of NIDA’s Clinical Research Grants Branch, says, “The pharmacokinetic testing results showed that experienced e-cigarette users obtained as much nicotine when ‘vaping’ from the SREC as from their device of choice,” demonstrating the SREC to be a good “model e-cigarette” and a viable standard that will enable researchers to compare data from different studies. Researchers are invited to include use of the SREC in appropriate NIH grant applications. NIDA has already received numerous researcher requests for the device. The first funded studies using the device are projected to begin in February 2018; they will focus on harm reduction and ask whether switching from combustibles to e-cigarettes can reduce smokers’ health risks. “Three upcoming investigations will track different biomarkers to see what bodily changes might result from switching from combustibles to e-cigarettes,” Dr. Hampson says. NIDA. "Available Soon: NIDA’s E-Cigarette." National Institute on Drug Abuse, 12 Jan. 2018, https://www.drugabuse.gov/news-events/nida-notes/2018/01/available-soon-nidas-e-cigarette. NIDA. Available Soon: NIDA’s E-Cigarette. National Institute on Drug Abuse website. https://www.drugabuse.gov/news-events/nida-notes/2018/01/available-soon-nidas-e-cigarette. January 12, 2018.